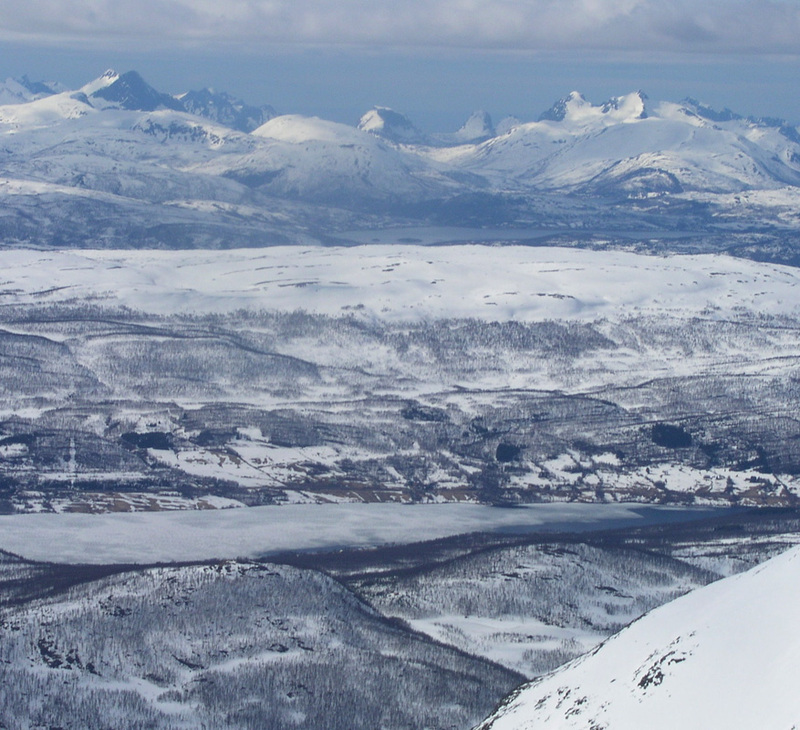 How to get there: From Tromsø, head south on Hwy. 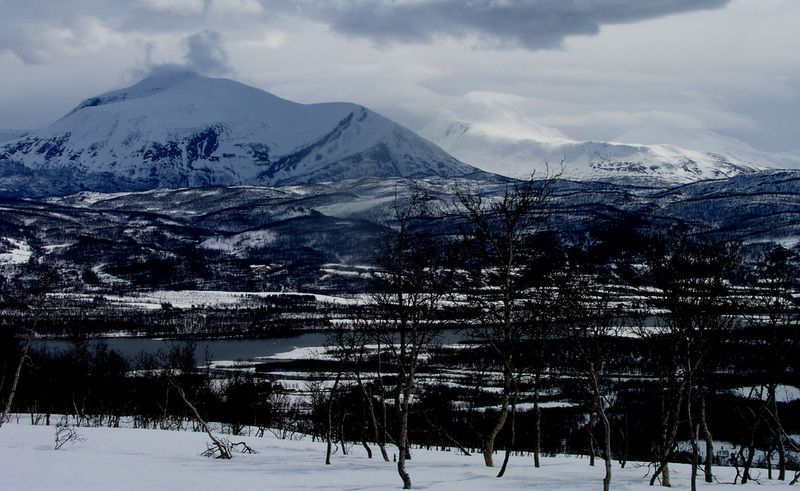 E8, then E6 to the small place Olsborg which is 122 kilometer from Tromsø. Olsborg is 12 kilometer north of Bardufoss along Hwy. E6. Continue on Hwy E6 across the bridge (crossing the river Målselva), then make a right on Hwy. 855 towards Finnsnes and Senja. Follow this road for about 9 kilometer to Karlstad. Here, Hwy. 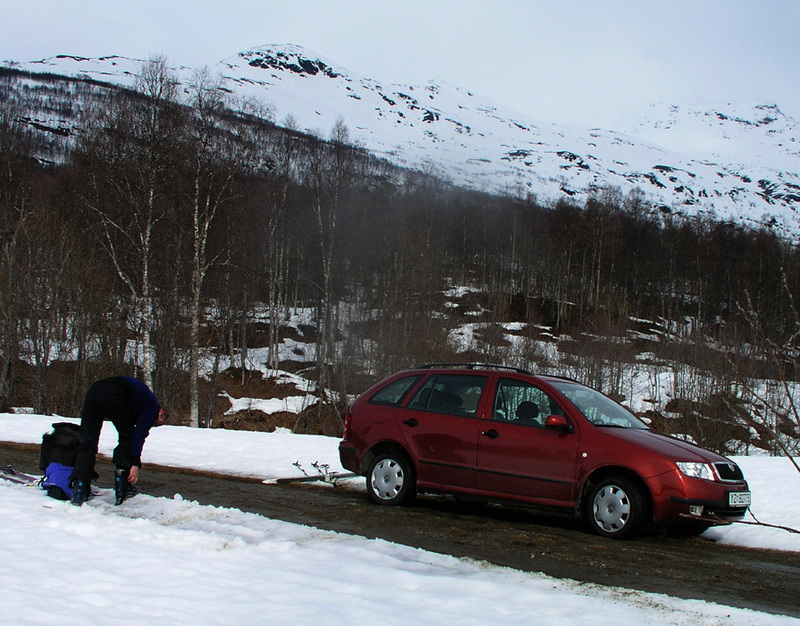 855 bends left and leaves the river, while a smaller road forks right, and continues along the river as the river becomes Målselvfjorden. Follow this smaller road for approximately 5 kilometer, just after the farm Tyttebærhaugen, there is a small forest road that goes left. This road has a sign saying "Kjør Forsiktig" (Drive Carefully) and informs that the road is used for horseback riding. This road can be followed for about 500 meter before it turns really ugly, even for a robust 4WD. This is the trailhead, park off the road in order not to block traffic. The precise location is north 69:15.446, east 018:28.662, elevation 27 meter. 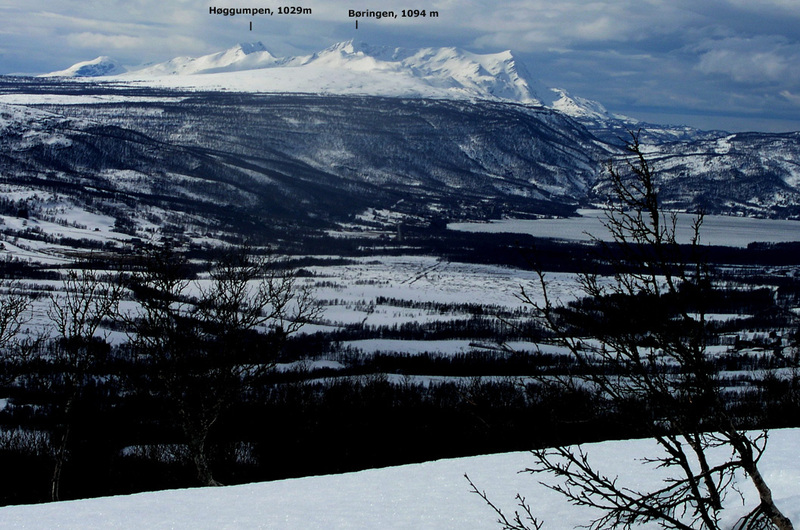 A convenient place to stay for climbing peaks in this area is Bardufoss Hotel, phone (+47)77830500, ask for Ann Sofie. This hotel serves breakfast starting at 0600, thus making an early start on good crust possible. Route description: From the trailhead, continue along the forest road. This road quickly gets very bad (even for a very robust 4WD). Shortly, the road forks with one branch going left, the other right. Take the right (north) fork for about hundred meter, just as the road levels out, look for a trail that heads left further up the hill. Follow this route as it climbs nicely between the trees and reaches two small cabins (one is called Alberthytta). The route now continues up the south ridge passing the point Varden (474m). This point has a cairn, just as the name says. Continue along the broad ridge towards point 779, the terrain gets a bit steeper here and the best approach is to ski towards the right into the hill just south of point 779, then do an ascending traverse to the left (west) in order to reach more gentle terrain above. Ascend back on the ridge just north of point 779, then follow the ridge in order to climb Storhompen 916 meter, an independent peak, or contour around it high on the east side. (One must ski high on this mountain anyway, so may as well visit the top.) Descend from Storhompen and visit the smaller subsidiary point 887. This can be skied slightly west. Next, descend north. The slope here is surprisingly steep. 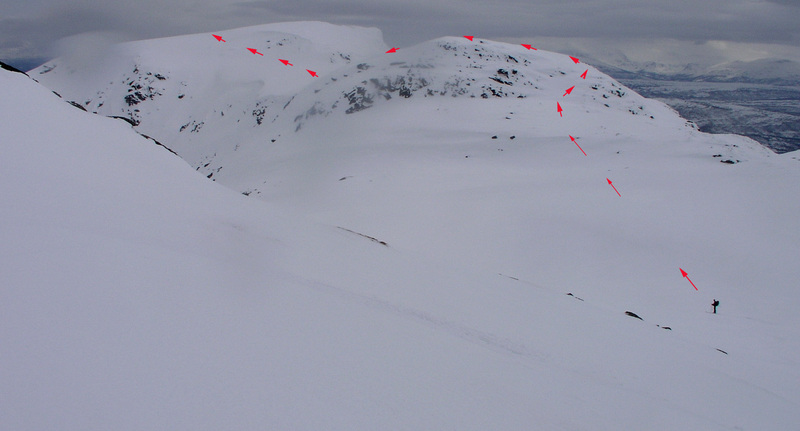 The best way is to first seek left (west) as far as a safe descent in this direction allows (the terrain quickly becomes steep below you), then proceed north down what is still a pretty steep, but fortunately short step. 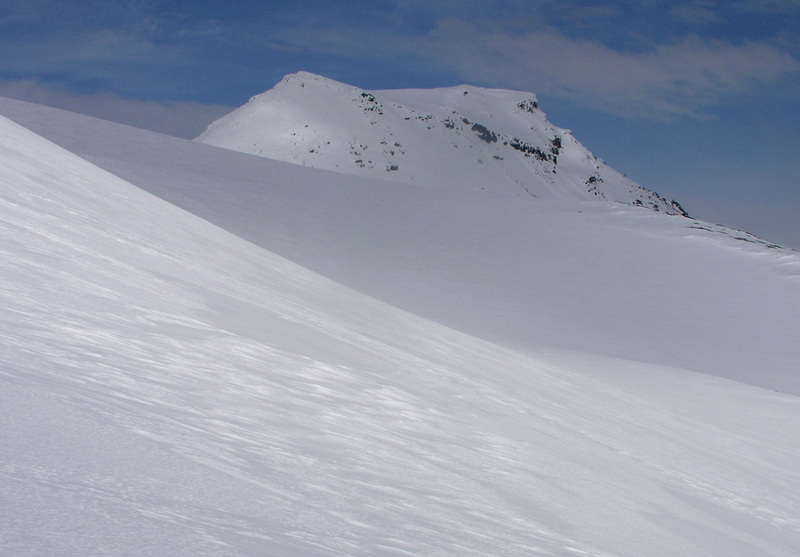 From here, ski about one kilometer slightly east of north, then start a gentle traverse climbing towards the north ridge of Leirtinden. 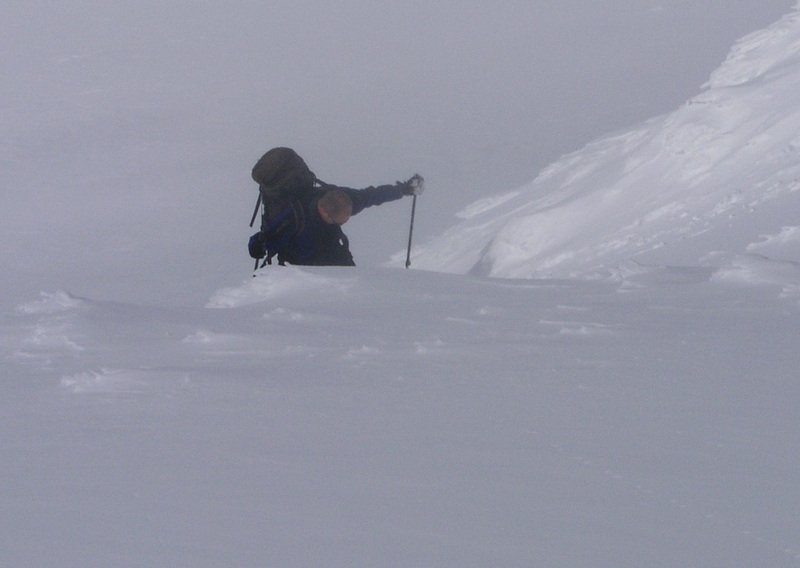 On foot, it seems perfectly possible to also climb the west ridge of the peak. 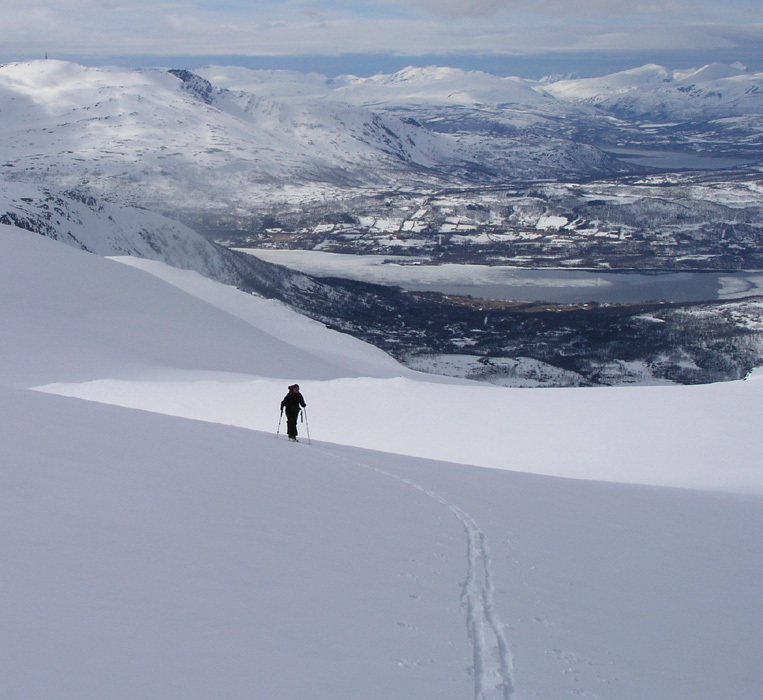 The north-west slope of Leirtinden is very nice for skiing, provided that the snow is stable. Finish your ascent by skiing near the north ridge, we left the skis about 10 meter below the summit and finished this slightly steeper section on foot. Return the same route, there will be lots of good downhill skiing. Comments: I did this climb with my friend Ståle Grimen. We started at 1030, made the summit at 1430, a 4 hour ascent. The route is nice, there is essentially one way to go, while the terrain easily gets too steep everywhere else. The weather was good and we enjoyed the summit area for 30 minutes. 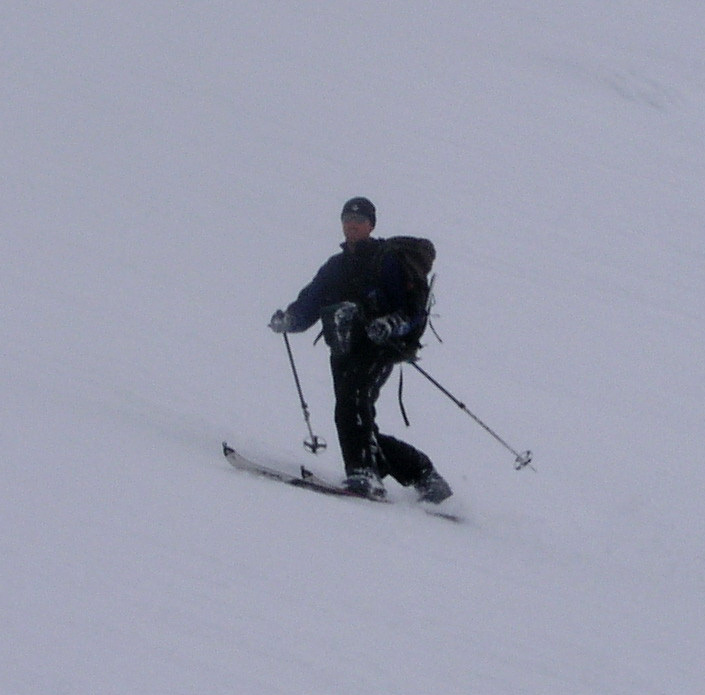 The ski descent back to the car was great fun and took 1:45, with a return to the trailhead at 1645. A very good day in the mountains. This was peak number 6 in my T5 trip. Next peak Snøhetta. Previous peak Rohkunborri. Leirtinden as seen from Stormauken. 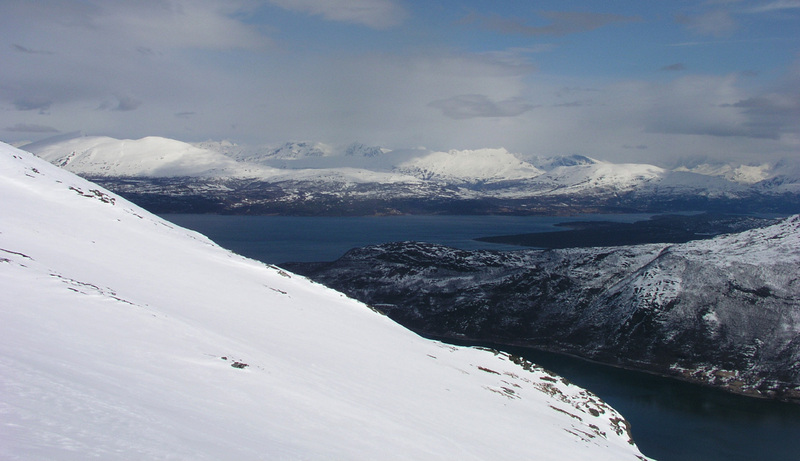 Mårtinden, as seen from the lower slopes. Crossing Storhompen, Leirtinden comes into view. 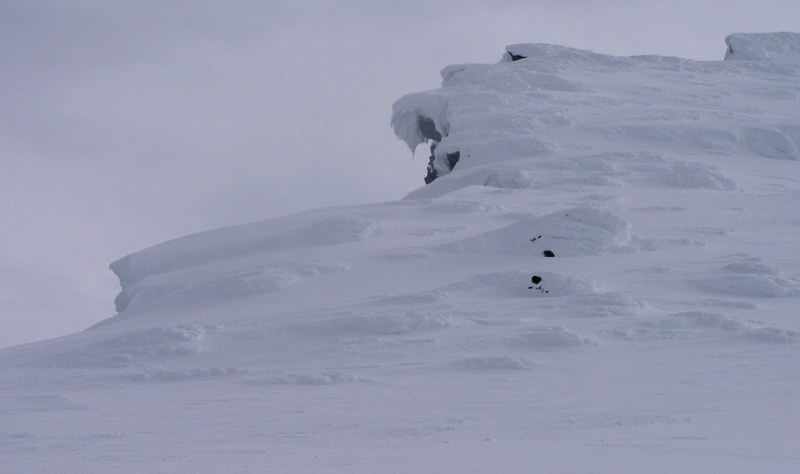 Near the north ridge, cornices. Ståle near the last slope. The last pitch is a bit steeper. 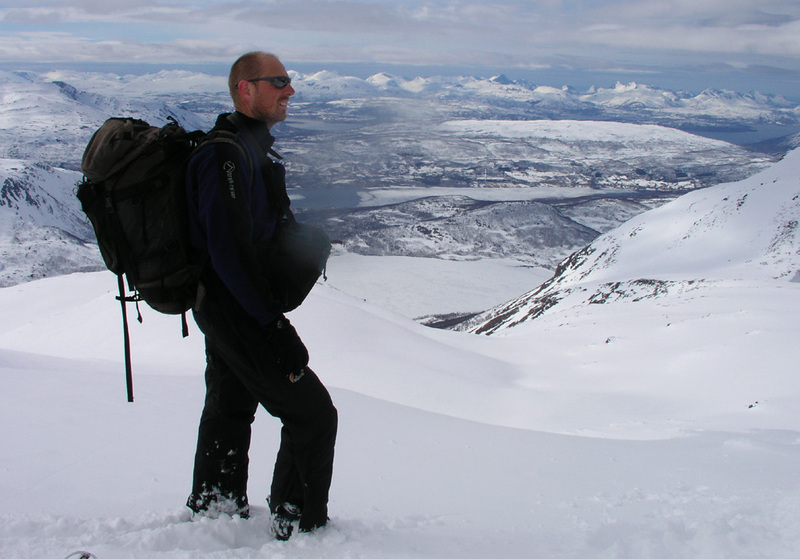 At the summit, Ståle enjoys the breathtaking Senja landscape. The route back to Storhompen.